Judge R.W.P. Muse reported on his travels during 1870 through the future Harvey County, “…large herds of buffalo were found in the western portion…. In fact buffalo meat was the principal diet at every house and ranch in the county….” The Newton Kansan of Sept 5, 1872 reported, “Fine herds of buffalo are now ranging within forty-five miles of Wichita.” An article in the July 17, 1873 edition of the Newton Kansan said, “Several farmers in the west part of the county are preparing to go out on a buffalo hunt in a few days, and others have already gone.” The era came to an end in 1874. 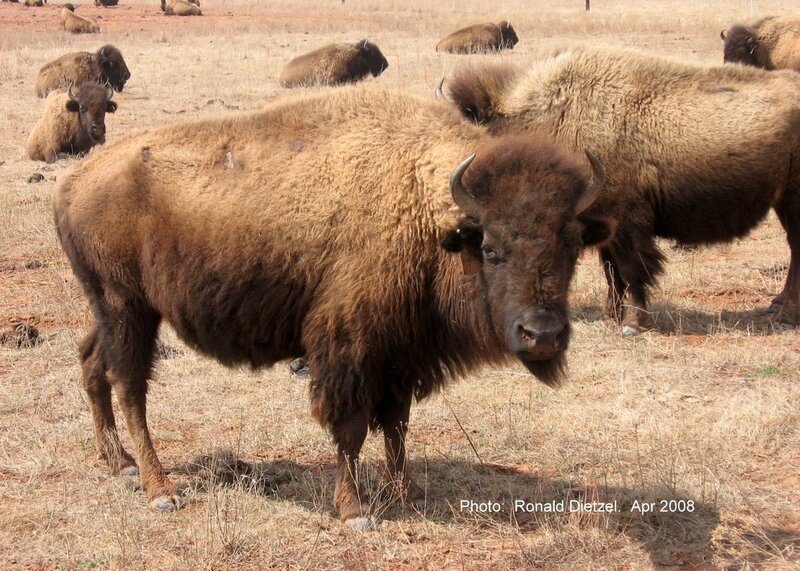 Judge Muse reported, “The last buffalo killed in the county was in 1874, in the Prouty neighborhood, in Macon Township.” Photo: Ronald Dietzel, April 2008.